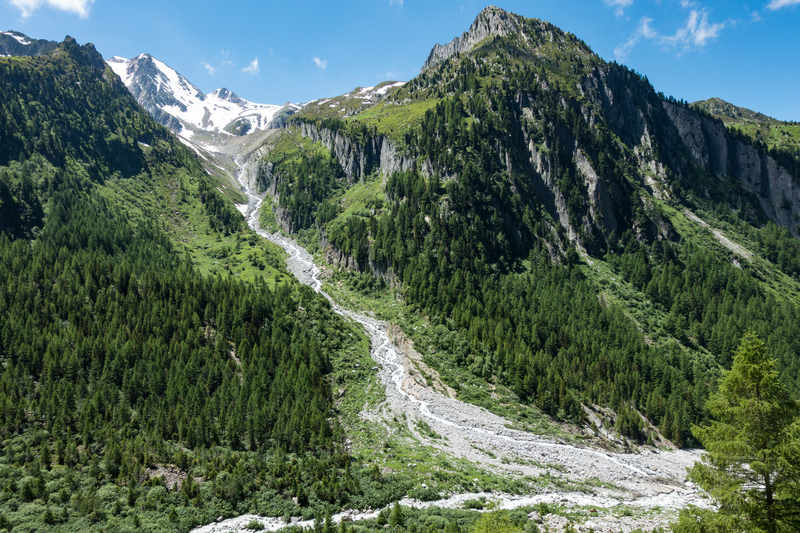 When compared to other stages on the Tour du Mont Blanc, Stages 7 and 8 in Switzerland offer surprisingly limited views of the surrounding glaciated peaks. This is not to say that these stages are not scenic; rather, the beauty encountered when traversing much of the Swiss side of the Tour du Mont Blanc is that of peaceful hamlets and pastures rather than the craggy peaks. Considering the reputation of Switzerland as a whole, it can surprise trekkers that this isolated corner of Swiss paradise is more tame by comparison. What you can find most here is evidence of simpler times as you walk through the valley toward Champex-Lac, passing through quaint villages. There are no course variations to choose from until you reach Stage 8, which has two dramatic variations. Stage 7 is also the easiest section of the entire Tour du Mont Blanc. With no mountain crossings or challenging alpine terrain, this is very much a valley walk with a short climb toward Champex in the end. Many lodging options exist in Champex, with another popular refuge at Arpette a short walk northwest of town toward the starting point for the high variant for Stage 8. Stage 8 has two very different variations depending on the desired strenuousness and scenery. Lodging for the end of Stage 8 will depend largely on which variation you are taking for Stage 8, and in some cases how you wish to tackle Stage 9. Both variations for Stage 8 meet at Col de la Forclaz, where some lodging exists, and a short walk down to Trient presents even more options. Alp Bovine of the standard route is very scenic, involving a combination of a balcony trail and forested undulating path that takes roughly four to five hours with 760 meters of climbing. The alternate route of Fenetre d’Arpette, by comparison, takes six to seven hours and involves 1,220 meters of climbing. As a word of caution, this route should only be attempted in calm, settled weather and in good conditions. Aside from the clue from the above statistics, this variant involves traversing much more technical terrain through a chaos of boulders and a final push through sheer steepness that will prompt a sigh of relief once you've made the summit. In good conditions this makes for an excellent scenic variation of the standard route, and it matches Col des Fours as the highest elevation for the entire tour. It is recommended for anyone with experience in rough mountain terrain and well-rested legs. The only alternative to these accommodations would be if you were planning the high variant from Trient to Col de Balme, in which case there is a shortcut to skip Trient altogether and stay at Refuge Les Grands to avoid losing elevation at the end of Stage 8, only to climb the same trail at the start of Stage 9. Waking up in La Fouly instills a certain tranquility in you, and it’s easy to forget about the world outside of Orsières in this tiny corner of Switzerland. Your day begins with a short road walk just to the outside of town and then across a bridge to the left side of the river. It is here that you will be spending the first half of your day. Much of this section is forested, but there are some openings in the trees that give way to views of the surrounding cliffs and mountains. Keep an eye out on the left for the Torrent du Treutse waterfall; with recent rain it can be quite impressive. 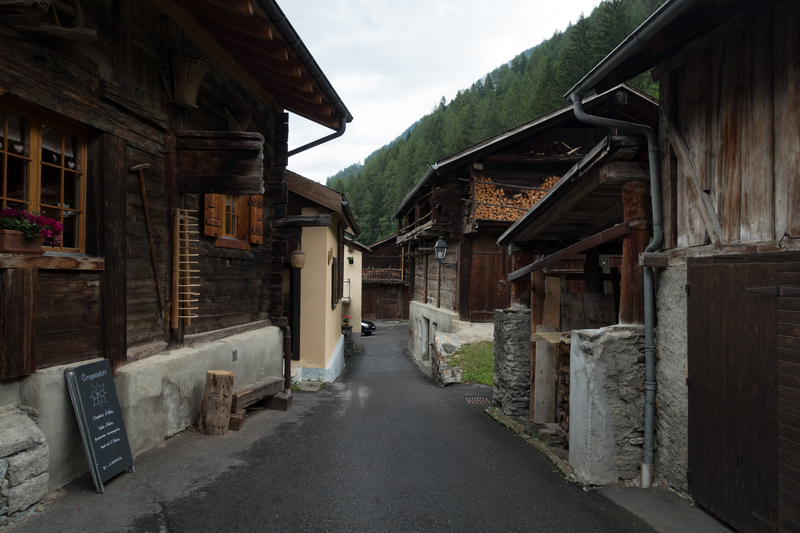 The trail continues through neighborhoods and small hamlets before going through Praz de Fort, which is a nice place to stop for refreshment. A few more small towns of Les Arlaches and Issert will be your last chance for a cafe stop before the climb to Champex-Lac begins. While this may be the easiest climb of the TMB, the easy walking thus far can tend to lull trekkers into a false sense of complacency and make this seem more difficult than it is. To distract from the climb, several breaks in the trees provide views of the valley below along with a host of strange and whimsical wood carvings of anthropomorphized squirrels, insects, snails, and other critters. Crossing the road to see the Champex-Lac sign will come as a relief. Several options for food and lodging will be there to greet you, but don’t expect something cheap. Due to the easy day, it can be beneficial to go past Champex to stay at either Relais d’Arpette or Auberge Gite “Bon Apris” depending on which variant you have intended for Stage 8; they are both only about 45 minutes beyond Champex. Mountains across the valley near Peuty. Either way to walk toward the Col de la Forclaz will be a beautiful one, so there is no wrong choice between the two variants here. The decision will depend on the weather, the season, your experience with more technical hiking, and how the body feels. Neither option will be easy, but the Fenetre d’Arpette variant is certainly more strenuous. For those taking the standard route, it is a tough, undulating trail that meanders along the contours of the ridge that protrudes from Pointe d’Orny. It continues toward Bovine, where excellent views and refreshments can be had, and then finishes with reasonable descent to the col. Views extend over the Rhone Valley and the Bernese Alps in the distance. The variant takes trekkers to the highest point on the TMB, matching Col des Fours from many days earlier, and over rugged alpine terrain and a large snowfield (depending on the month and recent weather). The climb starts gradually along two open fields just beyond the Relais d’Arpette refuge, and it then re-enters the trees. The climb begins to steepen, and it does not stop getting steeper until you are at the summit of the col.
Several rock slides will start to create openings in the trees and provide a boulder-strewn trail to guide you higher and higher into the boulders. There is an unsigned intersection that takes climbers toward the higher Col des Ecandies, which is much more technical and also more likely to be snow covered through the summer. Make sure to keep right at this juncture to continue toward the Fenetre d’Arpette; cairns and markings painted on the rocks will guide you. Follow the white flag with the red stripe that should be visible every few boulders once the boot path on the ground becomes too difficult to follow. An open area in the boulders will open, which holds a large snowfield into July depending on the weather that spring. At this point the pass should be very clearly visible; it is the only low point that is possible to traverse directly ahead of you. The trail will become considerably steeper, and use of hands will be very beneficial to balance as you climb the final few meters to the top. At the summit, the view will make all the toil worthwhile. Make sure to enjoy it for some time if the wind is not too strong, for the descent can be just as uncomfortable as the ascent due to the steepness. The highlight of the entire stage will be the view of the Trient glacier cascading down the valley the entire way down to the bottom. For those who have not been very close to glaciers before, this will be a sight you won’t forget, and it is the closest you’ll get to a glacier on the whole TMB. Follow the path down the valley. The steepest section will be over once you reach Chalet du Glacier Buvette, which is a great place to stop for refreshments and to sit and enjoy the view of the glacier and valley before continuing. It is at this point you would either turn left across the creek to head to Refuge Les Grands along the alternate Stage 9 or continue down the valley toward the end of Stage 8. Keep following signs to Col de la Forclaz until you are about 30 minutes away; you will have the option to hike down to Trient or Peuty if your evening’s accommodations lie at the valley floor. If staying at Col de la Forclaz, continue straight ahead and enjoy a well-deserved dinner after the difficult day. Great views. Rich culture. Lodging and amenities.